An 11-year-old girl's assertion that her school was guilty of a war crime has gone viral. Her father, Gavin Bell (also known as author Mason Cross), revealed on Twitter that she had gone rogue on a pupil feedback form. She criticised the policy of punishing a whole class for one person's bad behaviour - by citing the Geneva Conventions. "Not sure if I should ground her or buy her ice cream," Mr Bell mused. 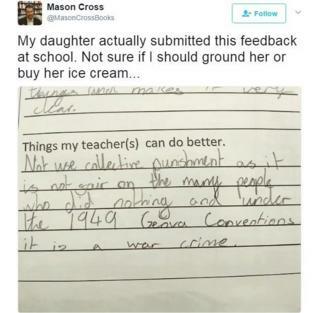 Asked what her teacher could do better, Ava Bell wrote: "Not use collective punishment as it is not fair on the many people who did nothing and under the 1949 Genva [sic] Conventions it is a war crime." The picture showing the suggestion, handwritten in pencil, has been "liked" more than 400,000 times on Twitter. Mr Bell, who is based in Glasgow, said his eldest child is "11 going on 47". "I should clarify that she thinks her teacher is awesome," he added. "It's just this aspect of the educational justice system she has an issue with." He told the BBC he came across the form at a parents' evening, where folders of the children's work are displayed for their guardians to read. He said it was entirely characteristic, laughing, "She will never let an argument go at home!" Various fellow parents joked that young Miss Bell was precocious, and this could be just the start for her. "Frightening... i am genuinely sorry for you for all those hard conversations which you will lose..." tweeted Brian Siddhu. One more cynical observer accused writer Mr Bell of making it up. "Meh, no way this actually happened. Shame on you, using your kid for rts [re-tweets]..." wrote tweeter @NagoyaPompey. The father replied: "Dude, if I'd made it up I would have got her to fix the spelling of 'Geneva.'" He told the BBC his daughter has "just loves looking into things". "She has a Google habit," he explained. "Usually it's along the lines of science and technology. "According to Ava, her teacher thought it was quite amusing!" Faced with the choice between ice cream or punishment, most Twitter users thought the schoolgirl deserved the dessert option. "I'm game to crowdfund her entire year's ice cream needs tbh," offered @PedestrianPoet. Her father's response was more measured. Mr Bell tweeted a picture of his daughter holding two cones of ice-cream, with the words, "The people have spoken".